Angus Mac Of is the Lord of Love; He helps lovers in need and in peril. For Angus, there is no such thing as an impossible love; he helps true love drfy all odds. When love goes wrong he comforts and protects the heartbroken. Angus is the fruit of illicit love. The Dagda and Boann had a passionate encounter. To hide her pregnancy, Boann forced the sun to stand still for the duration of her pregnancy thus Angus was conceived and born on the same day. After birth, His father took him home where Angus became a champion hurler. Petition Angus Mac Og if your love faces impossible obstacles Angus can inspire you to discover solutions. FAVORED PEOPLE: Lovers and those who wish to be lovers, he may also be the patron of hurlers. CONSORT: Caer Ibormeith. Angus fell in love with a girl he had seen in his dreams. His mother, Boann, searched Ireland for an entire year. Then his father, the Dagda, did the same. Finally, King Bodb Derg of Munster found her after a year. Angus went to the lake of the Dragon's Mouth and found 150 girls chained up in pairs. He found his girl, Caer Ibormeith. On November 1, Caer and the other girls would turn into swans for one year, every second Samhain. 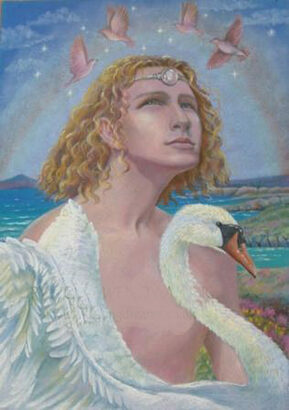 Angus was told he could marry Caer if he could identify her as a swan. Angus succeeded. He turned himself into a swan and they flew away, singing beautiful music that put all its listeners asleep for three days and nights. PALACE: Brugh na Boinne, now called Newgrange, a giant megalithic tomb estimated to have been erected circa 3200 BCE. When he came of age Angus dispossessed the Dagda of his home, the Brú na Bóinne. He arrived after the Dagda had shared out his land among his children, and there was nothing left for Angus, so Angus asked his father if he could live in the Brú for a day and a night, and the Dagda agreed. But Irish has no indefinite article, so "a day and a night" is the same as "day and night", which covers all time, and so Angus took possession of the Brú permanently.